The global load cell market is witnessing considerable rise in its valuation, thanks to the increasing demand for load cells in healthcare sector. The escalating need for home hemodialysis (HHD) machines has been the key factor behind the augmenting usage of load cells in the medical and healthcare industry. The market is also gaining substantially from the rising application of load cells in the testing applications across the aviation and the aerospace industries across the world. The opportunity in the worldwide market for load cells is likely to increase at a CAGR of 3.50% from 2016 to 2014, surging from US$1.87 bn in 2015 to US$2.55 bn by 2024. With the increasing demand for digital load cells in the heavy lifting industry, the future of this market looks thriving. However, its growth may be affected by the slowdown in the demand for analog load cells across various industries in the years to come. The worldwide market for load cells stretches across Europe, North America, Asia Pacific, the Middle East and Africa, and Latin America. Europe, among these, has emerged as the leading regional market for load cells and is expected to remain seated in this position over the next few years. In 2015, the Europe market for load cells contributed US$561.0 mn in revenue. 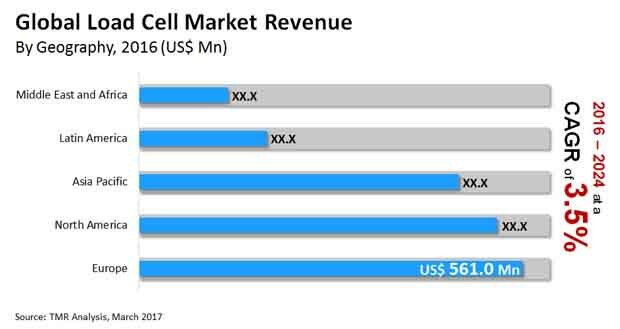 The high usage of these cells in the oil and gas, aerospace and defense, automotive, and bulk material handling industries has been boosting this regional market substantially. Going forward, the presence of a number of firms, which specifically cater to bulk material handling industries, such as the cement, coal and iron ore mining, and railway sectors, is likely to propel this market for load cells in Europe over the next few years. Germany and the U.K. are expected to surface as the key domestic markets for load cells in this region. North America is another fast-growing regional market for load cells. The increasing demand for these cells from the medical and healthcare, aerospace and defense, and the oil and gas sectors is expected to reflect positively on this regional market in the coming years. The U.S. is expected to lead the North America market for load cells and followed by Canada and Mexico. The Asia Pacific load cell market is also projected to witness healthy growth over the next few years, thanks to the rise in the bulk material handling industry in China, Japan, and South Korea. Technologically, there are two types of load cells available in the global market: analog load cells and digital load cells. The majority of load cells found in the market are of analog nature. In 2015, the total share of analog load cells in the overall market was more than 80%. However, over the coming years, the demand for digital load cells is expected to increase remarkably in heavy lifting applications in the near future. The global load cell market is highly fragmented in nature. Honeywell International Inc., Vishay Precision Group Inc., Flintec Group AB, OMEGA Engineering Inc., FUTEK Advanced Sensor Technology Inc., Zhonghang Electronic Measuring Instruments Co. Ltd., Hottinger Baldwin Messtechnik GmbH, Novatech Measurements Ltd., Yamato Scale Co. Ltd., Thames Side Sensors Ltd., Mettler Toledo International Inc., and Precia Molen are some of the key manufacturers of load cells across the world. Rising demand for load cells in healthcare sector is expected to increase demand for load cells. Medical devices and equipment including dialysis machines (in-center and in house hemodialysis), infusion pumps and surgical instruments among others are increasing the demand for load cells. The growth of hemodialysis machines including home hemodialysis (HHD) is driven by growing patient population, replacement of existing HHD machines among others. Rising demand for HHD machines (which serves only a single patient) will increase demand for load cells. The growth of infusion pumps will be driven by increasing occurrence of chronic diseases, geriatric population and rising surgical procedures. There is a growing demand for load cells in testing applications across aviation and aerospace industry. Load cells are used in design and testing during initial design, pre-flight and in-flight stages. In the design phase, standard load cells are used for aircraft component-testing such as cockpit instruments, aircraft flaps, seat belts among others. In the pre-flight stage dual bridge load cells test the frame structure. In the in-flight stage, load cells monitor forces acting on airframe, pilot’s touch on control stick and aircraft flight control system. Rising demand for load cells in upstream, midstream and downstream activities are increasing the demand for load cells. Load cells are used in the construction of oil rigs. Rising demand for oil rigs will increase the demand for load cells. New, high specification and harsh environment oil rigs, replacement of old rigs, and interest of private equity to purchase oil rigs is expected to push the number for oil rigs which will positively impact the demand for load cells. Rising demand for oil rigs from shale gas producers in the U.S. is expected to increase demand for load cells. By end use industries the load cell market is segmented into healthcare, agriculture equipment, oil & gas, aerospace & defense, automotive, bulk material handling, retail and others. Based on type, the market is segmented into single-point, s-type, shear beam and others. By technology the market is segmented into analog load cells and digital load cells. Analog load cells are the majority of load cells found in the market and command a market share of more than 80%. Geographically, the global load cell market is segmented into Asia Pacific, Middle East & Africa (MEA), Latin America, Europe and North America. The market for load cell has been provided in (USD million) in terms of revenue as well as the CAGR for the forecast period of 2016 to 2024. The report also provides assessment of different drivers that is impacting the global market, along with the restraints and opportunities that has also been covered under the scope of this report. All these factors helps in determining different trends that has been impacting the overall market growth. Moreover, after taking into consideration all this factors, an extensive analysis of the region wise growth parameters of load cell market along with the overall assessment for the forecast period of 2016-2024 has been also been provided within this report. The key players in the load cell market have been competitively profiled across the five broad geographic regions. This competitive landscape is inclusive of the various business strategies adopted by these major players and their recent developments in the field of load cells. Further, the report includes the market attractiveness analysis of different types, technology on of load cell and insight into the major application area of the load cells. Some of the leading players operating in the market are Honeywell International Inc. (the U.S.), Vishay Precision Group (VPG) (the U.S.), Flintec Group AB (the U.K.), OMEGA Engineering Inc. (the U.S.), FUTEK Advanced Sensor Technology (the U.S.), Zhonghang Electronic Measuring Instruments Co., Ltd. (ZEMIC) (China), Hottinger Baldwin Messtechnik GmbH (HBM) (Germany), Novatech Measurements Ltd. (the U.K.), Yamato Scale Co. Ltd (Japan), Thames Side Sensors Ltd. (the U.K.), Mettler Toledo International Inc. (the U.S.), Precia Molen (France) among others.